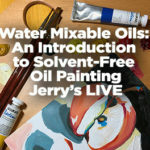 Want Less Cracking in Your Oil Painting? Many oil painters will advocate “Fat over Lean” painting but not everyone knows exactly what that means. 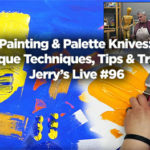 Today, we are going to explore that topic and share some of the best new mediums to improve your oil painting. In order to make sure the paint adheres properly in layers, and will dry at appropriate times (and your painting doesn’t become cracked or damaged), it is very important to paint Fat over Lean. It does not refer to thickness of paint, but instead to amount of oil: paint with more oil content (Fat) over paint with less oil content (Lean). Fat over Lean refers to the oil painting principle that applying paint with a higher ratio of oil to color pigments OVER paint with a lower ratio of oil to color pigments can ensure a more flexible paint film that will not crack later on down the road when the paint dries and ages. Since the drying time of various oil paints varies, making sure that your upper layers of paint dry slower than the lower layers is vital to the longevity of your painting. Painting Fat: If you add oil to the paint out of the tube, the paint becomes fatter. Fat painting is characterized by oil-laden, glossy, and slightly stickier texture, and has much more sheen to it. 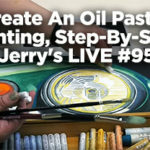 Painting Lean: If you add solvent (like Spike Oil or Turpentine) to the paint out of the tube, the paint paste becomes diluted with a drying agent, and thus leaner. The paint will look thinner with less sheen, and have a more matte or satin appearance. 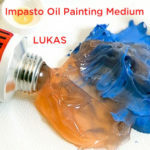 After your bottom layers are painted with thinned paint and a solvent to get down the underpainting, mix your oil paint with lean medium to make the oil paint paste workable, which will allow your bottom layers of your painting to dry faster, yet bond better with some oil content in the lean medium. The closer to the bottom layers, the thinner the paste will be (as it is leaner than straight paint), then adding less with subsequent layers. As the painting progresses, switch to a fat medium to add to the paint paste, to make the film workable. Then if desired, straight painting oils can be added to the last layers, which would be the fattest layer, drying the slowest (since dryers are not added to straight oil). Chelsea Classical Studio Clarified Lean Medium–Handcrafted from the finest materials, this oil medium thins paint and decreases drying time!– a handmade oil medium that uses lavender spike oil essence, which is a safer alternative to ones made with turpentine, as it smells sweet, decreases drying time and thins the paint. It is crafted from a mixture of pure, extra-pale, cold pressed linseed oil and lavender spike oil essence. For Chelsea Classical Mediums, even the ingredients of their mediums are handcrafted to ensure absolutely the highest quality products. The oil in the Clarified Lean Medium is cold-pressed, purified and de-yellowed by traditional, natural processes that strives to make the palest, cleanest pure linseed oil for artists to use. The Oil of Spike Lavender Solvent is made from distilled lavender which is a clean, safe to breathe solvent with a strong sweet smell. A “Lean” Medium refers to the “Fat Over Lean” technique, which means to apply a paint layer rich in oil (a fat) over a layer with less oil (a lean) layer on a painting. This simple principle is fundamental to controlling the paint adhesion, drying time and glossiness of oil colors. This fine-art quality medium has a light oil content mixed with the Spike Lavender Solvent, so it will thin the paint, make it dry faster, and is recommended for the early layers of painting. Chelsea Classical Studio Clarified Fat Medium– A handcrafted oil medium that improves glossiness and dry time!– “Fat” Medium refers to the “Fat Over Lean” technique, which means to apply a paint layers rich in oil (a fat) over a layers with less oil (lean) when painting. This simple principle is fundamental to controlling the paint adhesion, drying time and glossiness of oil colors. 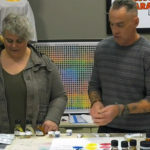 The Fat Medium, by Chelsea Classical Studios, is a handmade oil medium that decreases drying time (in comparison to oils straight from the tube) and increases glossiness. It is crafted from a mixture of pure, extra-pale, cold pressed linseed oil, Oil of Spike Lavender Solvent, and Damar Varnish. For Chelsea Classical Mediums, even the ingredients of their mediums are handcrafted to ensure absolutely the highest quality products. The linseed oil used is purified and de-yellowed by traditional, natural processes that strive to make the palest, cleanest, pure linseed oil on the market. The damar resin is dissolved in distilled Oil of Spike Lavender Solvent and then mixed with the linseed oil, imparting a “high oil content” that makes the paint paste glossy, fat, and beautifully shiny.